Don’t underestimate his research! Here is the official paper: Frictional Coefficient under Banana Skin. 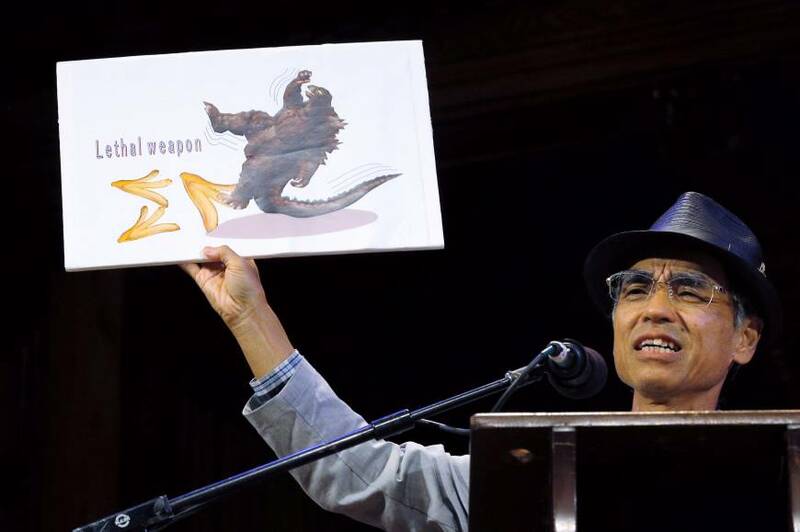 A few more examples of Ig Nobel prizes. 2014 Neuroscience: to Jiangang Liu, Jun Li, Lu Feng, Ling Li, Jie Tian, and Kang Lee, for trying to understand what happens in the brains of people who see the face of Jesus in a piece of toast. 2013 Biology/Astronomy: Marie Dacke, Emily Baird, Marcus Byrne, Clarke Scholtz, and Eric Warrant, for discovering that when dung beetles get lost, they can navigate their way home by looking at the Milky Way. But now it has become more serious, the prize winners eagerly travel (at their own expenses) to Harvard to attend the ceremony and the prizes are given by “real” Nobel Prize winners. 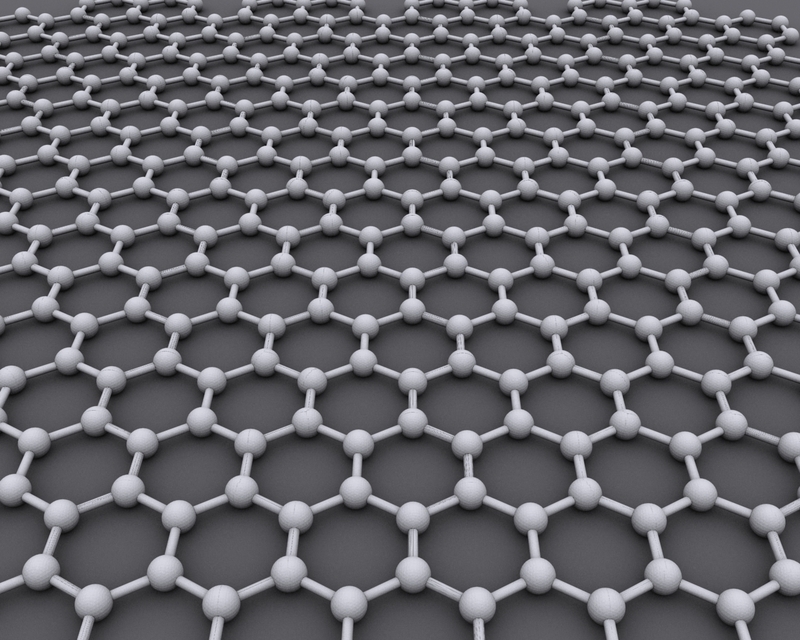 Ten years later, in 2010, Geim received the Physics Nobel prize for his research about the new wonder material of graphene, a two-dimensional layer of carbon atoms. 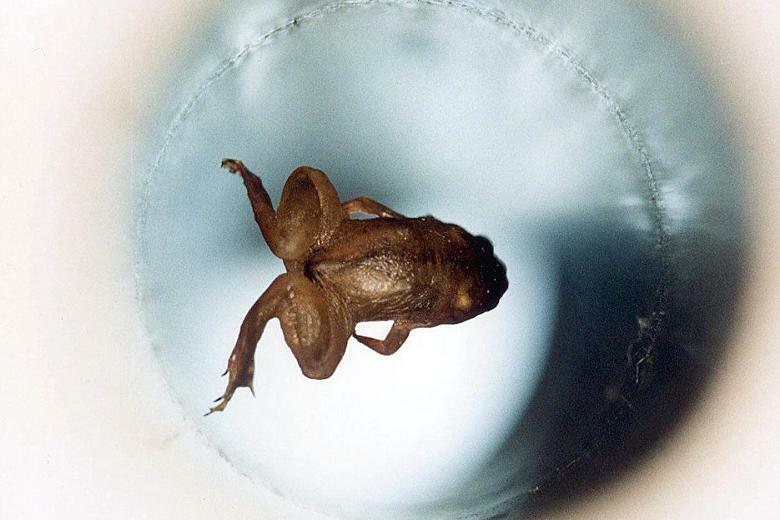 The way he and his collaborator Novoselov managed to make a single layer of carbon atoms? They used Scotch tape! In my last Journal I mentioned an unsuccessful hike to a remote waterfall, where we went back because I felt “discomfort”. After my cardiologist had given me a clean bill of health, of course I wanted to go back and give this Batangsi waterfall another try..:-) This time with Aric, Edwin, Janine, Nick and Siang Hui as our guide. We met at Sg Long for breakfast, after which we bought our lunch at the lively pasar pagi. 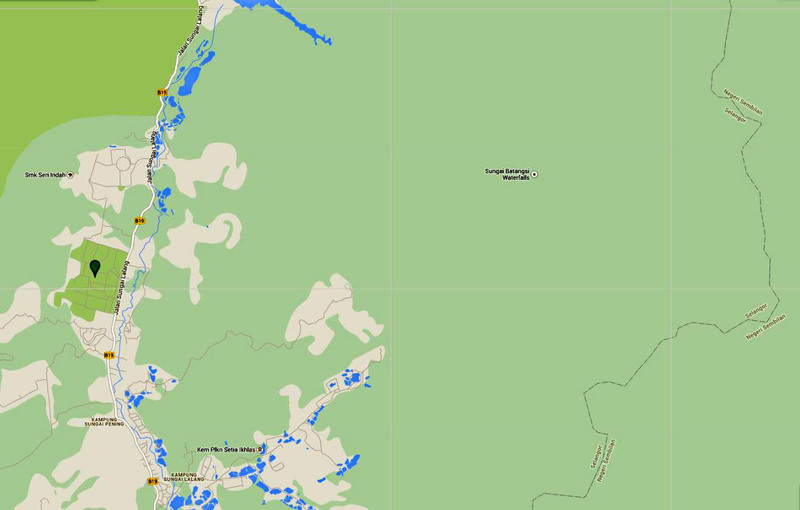 Before I start the report about our hike, it may be useful to explain first why we are so interested in the mysterious Batangsi waterfall…:-) Here is a Google Map of the region (click to enlarge). At the top you see part of the Semenyih reservoir. The green marker gives the location of the well-known Nirwana Memorial Park and to the right you see the border between Selangor and Negeri Sembilan. And in the middle of nowhere there is a marker for the Batangsi Falls! Could there really be a waterfall there, or is it just a mistake of the map maker? On the topo map of the region there is no mention of a waterfall. Intrigued by this mysterious fall, we have been exploring the region several times during the last ten (!) years. 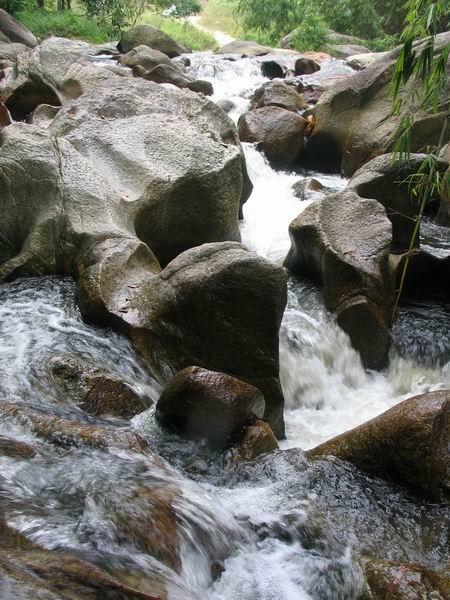 We found the Batangsi river with a few cascades and small waterfalls. 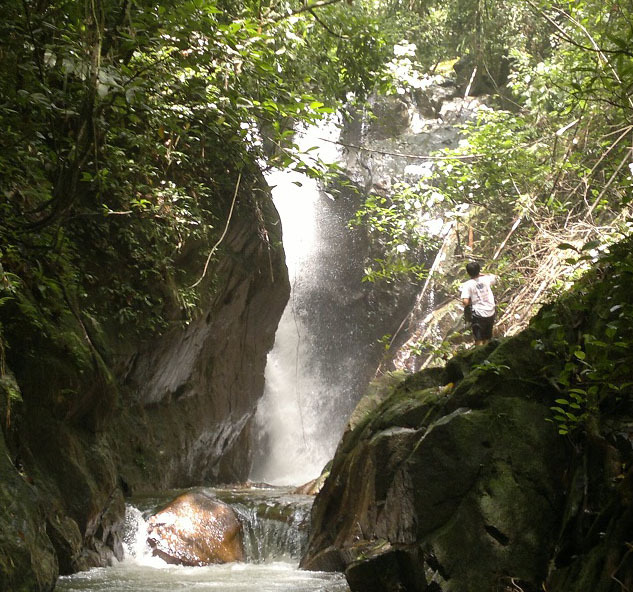 It resulted in a webpage Batangsi Fall on my Waterfalls of Malaysia website. Here are two of the small waterfalls/cascades we found. Were there more waterfalls upstream? In 2008 I joined Aurelius and his friends, we followed a farm road until the end. From there we river trekked upstream for about three hours. Nice hike but no waterfalls. 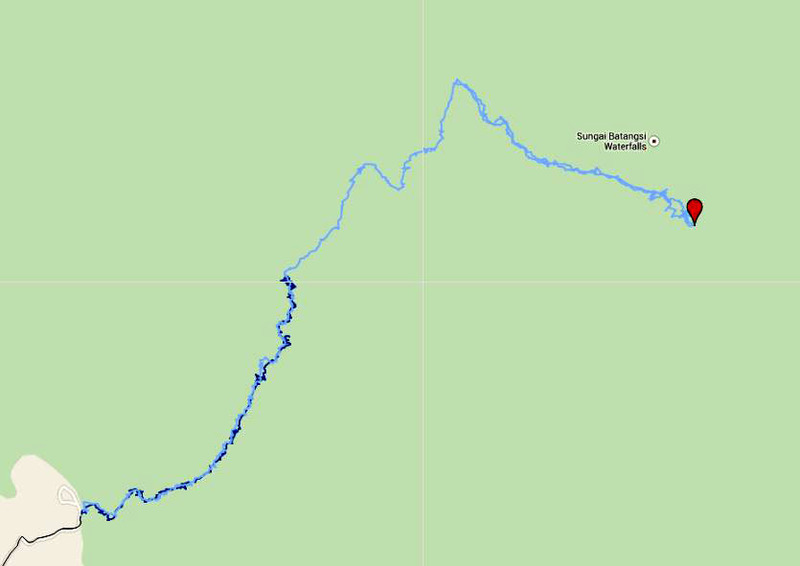 Here is a Google Map with our hike. 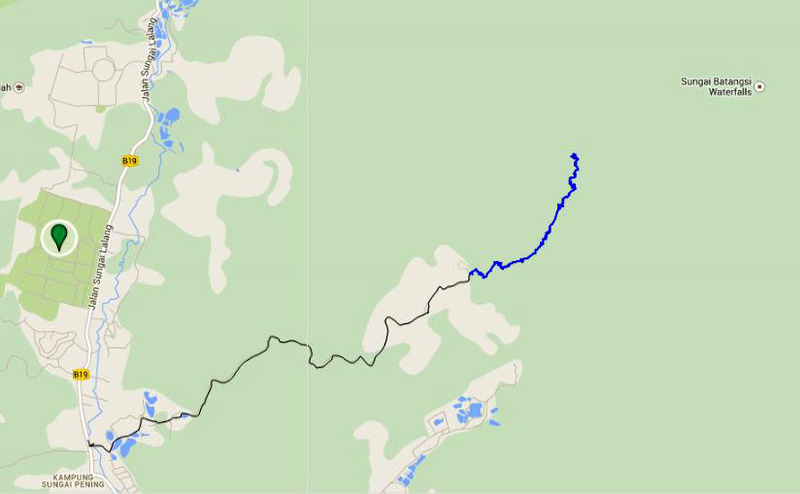 Black is the farm road, blue the river trekking. During this hike they had come to a split of the Batangsi river and decided to follow the right branch. Could there be another waterfall in the left branch? 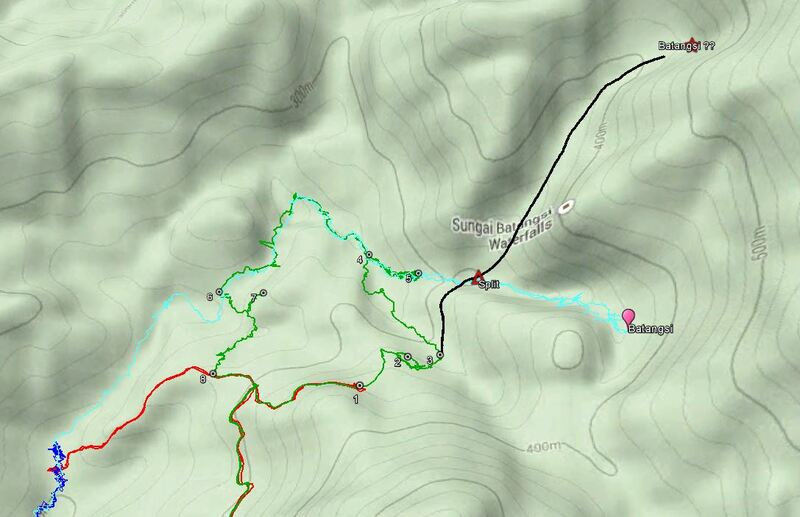 Studying the contour lines of the topo maps, Siang Hui thought there might be one. When you look at the first map picture in this blog, you will notice that there are two farm roads leading inland and for our next recce we took the other one. It ends at a temple, from where a clear trail starts. Unfortunately I did not feel well after about one hour hiking , so we turned back. Here is a Google Maps screenshot. The possible waterfall is marked with a red star. After this “longish” introduction, here is the report about our latest hike. Again we followed the farmroad, passing flower and vegetable farms, until we reached the impressive Buddhist temple. We started our hike from the temple at 9:15 am and were back at 5pm. It was an interesting, tough hike, but we did not reach the waterfall! However, we have now a clear idea how to proceed on our next, and hopefully final hike…:-). 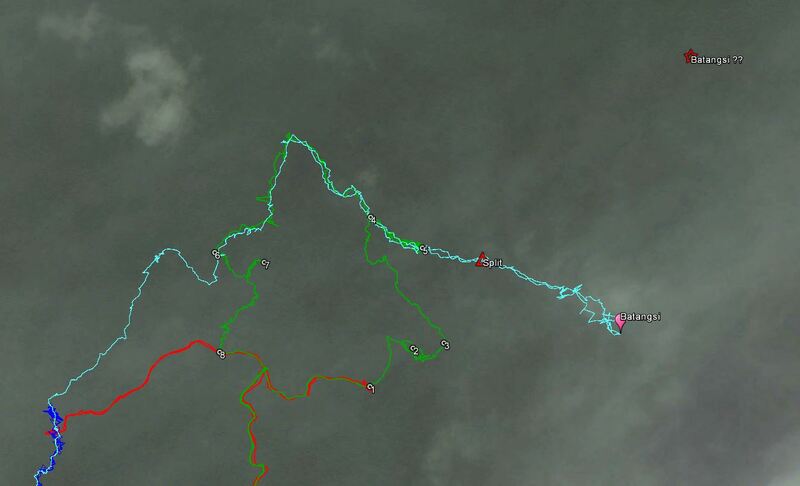 Here is our hike (in green) on Google Earth, only the main part is shown (click to enlarge) and I have numbered a few points of interest. The coloring is a bit different, dark blue is my trip with Aurelius, light blue the hike of Siang Hui and Harry and red our aborted hike. From the temple it took us about one hour plus to reach point (1) where I went back during our last recce. Until there the trail was well kept so we were expecting that from there it would continue. But after another half hour hiking, the trail disappeared (2). We backtracked to see if we had missed the trail, but it was really gone. From that point Saing Hui had to do a lot of chopping. After a while we reached a small stream (3) and we decided to follow it back to the Batangsi river. In retrospect that was a mistake, as we were only about 400 meter away from the river split we wanted to reach. 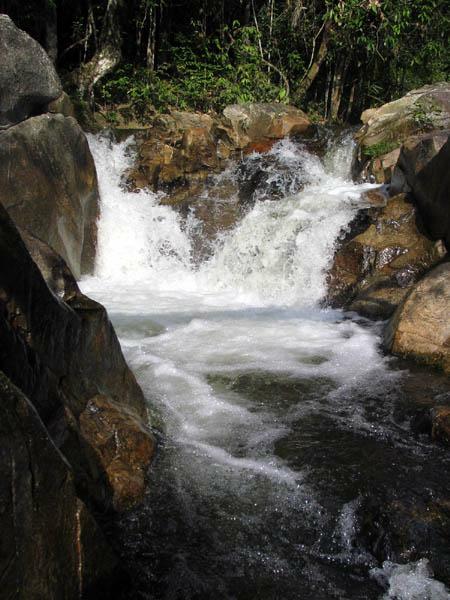 After we reached the river (4), we trekked upstream to a small waterfall where we had lunch and a bath (5). It was already getting late and we decided not to continue, but river trek back. River trekking is fun, but also slow, so when we reached a run-down biker camp (6) near the river, with a trail going uphill, we decided to take that trail. Also here we lost the trail and it took us quite a long time, after even going in a completely wrong direction (7) for a while, to reach the logging road (8)! Getting lost with three GPS! Siang Hui and Nick had to go back home early, so it was only the four of us who could enjoy a delicious seafood dinner in Semenyih. A memorable trip. We are thinking about a (hopefully) final attempt. After reaching the small stream (3) not following it but chopping our way to the confluence. From there river trekking. Then basically the same way back. The black line in the map below. But of course also quite a lot of social activities, like meeting friends and enjoying food. Here is a selection of (food) pictures. Soon after I was back home and acclimatised, the urge came to visit a waterfall. 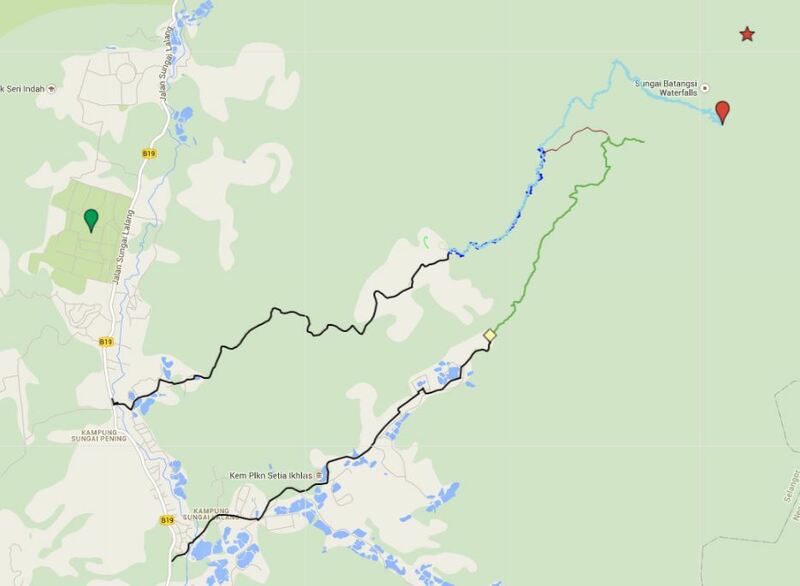 So I eagerly accepted my friend Siang Hui’s invitation for a recce to a remote waterfall in the Semenyih region. It would be a long hike, we had to leave early. Three of us, my friend Teoh also joined. Maybe because I did not sleep well the night before, but after about one hour on our way, I did not feel well, a tight feeling in my chest. After a discussion with my friends, we decided to go back. I was worried (and not only I…haha), so I made an appointment with my cardiologist for an echo and a stress test. I could see him only after Hari Raya (the end of Ramadan), so I kept quiet a bit for a while. Quite relieved when the results were ok! With Hari Raya we visited Aric’s hometown. 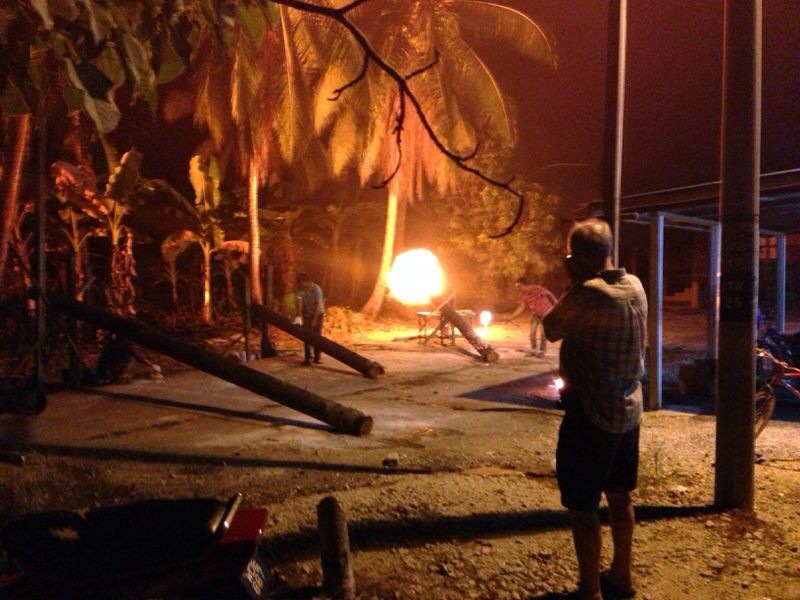 It is an old Malay custom to fire impressive coconut palm canons, celebrating the Hari Raya Aidilfitri festival. 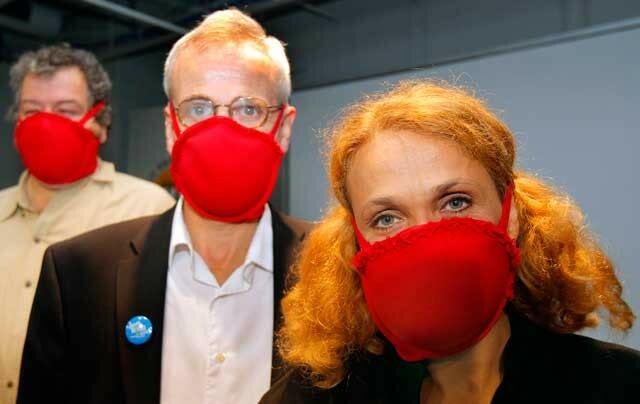 And impressive it was, I was worried for a while that it might affect my hearing. I wrote a separate blog about it: Boom Boom!! After I had received my clean bill of health, I was looking forward to meet Akke and Pim and show them a few nice places in my 2nd home…-). Akke is the daughter of friend of mine, who, with her future husband, was traveling in Malaysia. We visited the Kanching waterfalls and the Batu Caves and completed it with a delicious dinner, prepared by Aric. Here are a few recent pictures of Bukit Kiara, where I have my daily exercise. I have written many blog posts about it, you can find them here . I am quite pessimistic about its future, JLN (the National Landscape Department) is trying to transform it into a concentration camp, including barbed wire fencing ..:-( But still beautiful, along the budding Penchala river I have hidden another of my geocaches. On my way back from Taiping, I decided to stop at Pos Dipang to meet my Orang Asli friend Jinnah and his family. Recently he has been our guide to the spectacular Pos Dipang waterfalls.Very nice people. 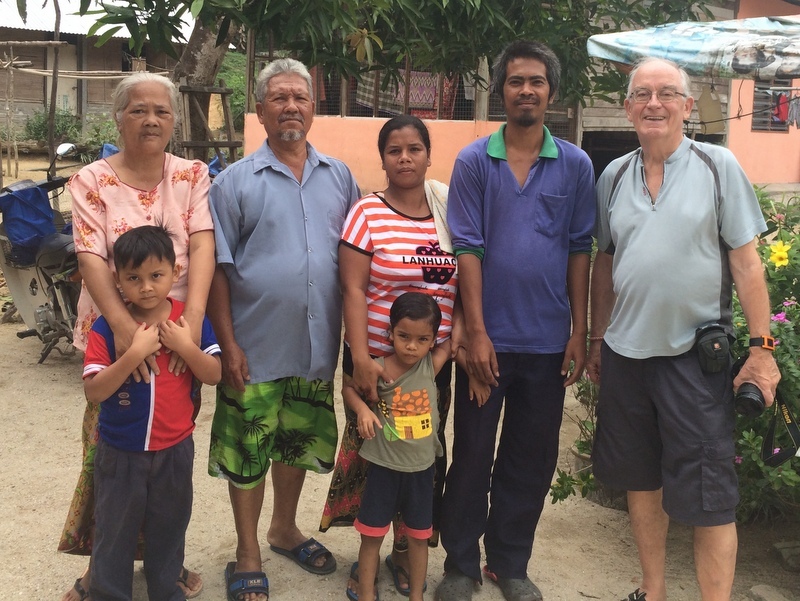 They belong to the Semai tribe, my Bahasa (Malay language) is bad, but we could communicate quite well in broken English.